Puppet Lamb Chop loves her earrings. On this special night, Lamb Chop picked out her favorite custom Open Hearts by Jane Seymour pave diamond earrings and will present these earrings to the winner of this lot. This special puppet is the “daughter” of the great ventriloquist, Shari Lewis and currently lives with her “sister” and guardian, ventriloquist Mallory Lewis, daughter of Shari Lewis. These two lovely ladies will help the lucky bidder craft their own Lamb Chop puppet and co-teach a private ventriloquism lesson in Malibu, California. Join couture designer Carmen Marc Valvo at his New York Fashion Week February 2018 runway presentation. The lucky winner of this lot will sit in the front row with the celebrities (Katie Couric, Vanessa Williams, Hilaria and Alec Baldwin are usual suspects in the front row!) and receive a gown from Carmen’s couture line (approximately valued at $5,000). The lot also includes an intimate champagne reception at Carmen’s opulent atelier in NYC’s Fashion District after the runway show! Four guests will join actress/artist Jane Seymour at her Malibu home for a day of visual and culinary art. The lucky winners of this lot will learn various painting techniques and create paintings with Jane Seymour as their art teacher! Following the painting lesson, the foursome will join Jane for lunch overlooking the Pacific Ocean with a meal prepared by her personal chef with organic ingredients from Jane’s garden. This lot also includes a private tour of Jane’s Malibu property and its incredible gardens and a group photo in front of her monumental Open Hearts sculpture in the home’s garden. Truly, A day to remember! Calling all aspirational rockstars to get a taste of guitar fame! 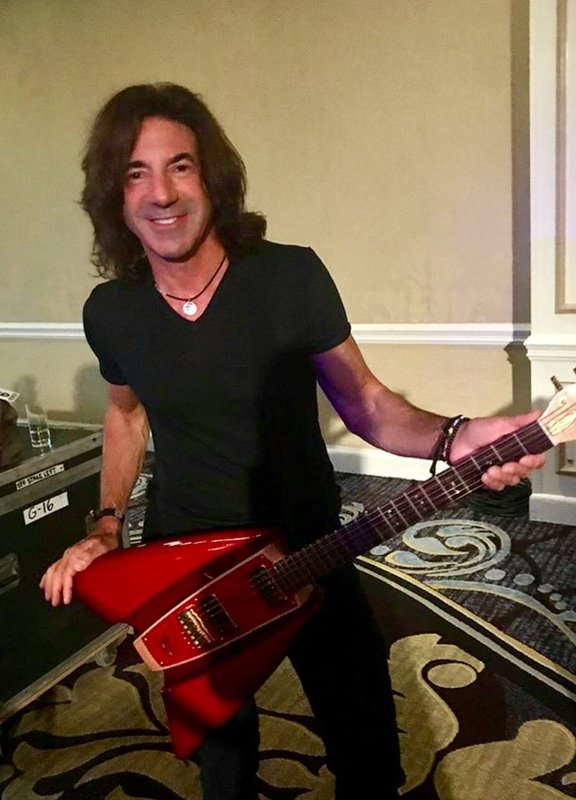 Stef Burns is the lead guitarist for Huey Lewis and the News as well as Italian superstar Vasco Rossi! Throughout his career, he has played alongside Alice Cooper, Michael Bolton, Sheila E, Y&T, Prince, Pablo Cruise and Berlin. This lot includes a private lesson with Stef, and your own RKS Uluru Boomerang guitar from the private collection of RKS founders Ravi and Amalia Sawhney. This special guitar has been signed by Stef, Huey Lewis and original Huey Lewis and the News band members Johnny Colla and Sean Hopper! Additionally, the lucky winner gets to hang backstage with Stef at a Huey Lewis and the News concert during the 2018 tour! Dine with Multi-Generational Philanthropists in the Napa Valley. Four couples will enjoy a Michelin-star dinner at Gina Gallo and Jean-Charles Boisset’s iconic home overlooking California’s Napa Valley. This spectacular estate was the long-term home of Robert and Margrit Mondavi. The dinner will revolve around a philanthropy through the generations theme and be prepared by multiple Michelin-star recipient Chef Roland Passot, of La Folie in San Francisco. Each couple will receive a magnum of Raymond Vineyards Generations Cabernet Sauvignon from the private collection of Jean-Charles Boisset that will be signed by all dinner hosts and a pave diamond Family Hearts necklace from the Open Hearts by Jane Seymour Collection. Beauty entrepreneur and wife of Robert Mondavi, Jr.
One-night stay at a luxury hotel in the Napa Valley and car service to and from the hotel to the Gallo-Boisset residence is included for each couple. Donors: Gina Gallo-Boisset and Jean-Charles Boisset, Lydia and Robert Mondavi, Jr, Jane Seymour, Chef Roland Passot. The Open Hearts design embodied the advice received and given by Jane Seymour’s mother - only when you keep your heart open can you best give and receive love. The winner of this lot will receive a custom 3 ½ ct diamond iconic link bracelet set in 18K white gold from the Open Hearts by Jane Seymour collection. This bracelet was specially designed for celebrity red carpet wear. The bracelet is making its final celebrity appearance with Open Hearts Foundation founder, Jane Seymour at this evening’s gala. Legendary Glen Campbell was a musician, artist and 2014 Open Hearts Award recipient. ● A DVD of “I’ll Be Me,” filmmaker James Keach’s documentary about Glen’s struggle with Alzheimer’s Disease during his farewell tour. In 1969, Glen Campbell became one of the first-ever Ovation Guitars endorsers. Through his nationally syndicated television program, “The Glen Campbell Goodtime Hour,” Glen brought an Ovation guitar into millions of American households every week. As Glen was suffering from Alzheimer’s, in 2014, he spent a special day painting with Jane Seymour in her art studio. The two paintings he created that day hang in the Campbell family home in Nashville. This lot includes a numbered set of giclee prints of those extraordinary paintings. On August 24, 2017, friends and family of Glen Campbell remembered him with a celebration of life and music. Included in this lot is a special memorial poster from a collection of 400 printed. All proceeds from this auction lot will benefit the CareLiving Foundation in memory of Glen Campbell. Beverly Hills Magazine calls noted Los Angeles native, Chris Dellorco, the Artist of Romance. He lives up to the title with his spectacular oil painting of Jane Seymour in character as Elise, from Somewhere in Time - which the lucky winner of this lot will cherish for generations to come. This world renowned artist’s work can be seen on posters for films such as Conan the Barbarian, Coming to America, Revenge of the Nerds, as well as Disney movie covers, such as The Lion King, Sleeping Beauty, Beauty and The Beast, and many more. The lucky winner of this lot will celebrate the 28th anniversary of Somewhere in Time at the Reunion Weekend celebrations in October 2018 (exact date TBD) at the Grand Hotel on Mackinac Island. This is the perfect weekend for movie lovers who want to know the cinematic secrets of the timeless romantic classic. This special three-night weekend includes a screening of the film, discussions of the movie’s production process, and appearances by returning cast. Guests are invited to make a cameo appearance in costume at the cocktail receptions, costume promenade, Grand Luncheon Buffet and five-course dinner celebration. Stop motion video of a portrait of actress Jane Seymour from her iconic role in Somewhere in Time by famed movie poster artist, Chris Dellorco. Anthony E. Zuiker is the creator and executive producer of the most watched TV series in the world, CSI: Crime Scene Investigation. He also produced all other editions of the franchise - CSI: Miami, CSI: NY and CSI: Cyber. In addition to the inspiring sculpture, four guests will enjoy a special dinner with Anthony and his wife, Michelle Zuiker, at their stunning Malibu home overlooking the Pacific Ocean. Jane Seymour and her boyfriend, director David Green, will also be in attendance to talk about Anthony's inspiration for the sculpture. Anthony will pop corks on his favorite award-winning wines from Grassini Family Vineyards in the Santa Barbara wine region. As a special memento of the evening, Anthony and Jane have signed a bottle of the Grassini Family Vineyards Cabernet Sauvignon to add to your own private wine cellar! Jane adorned the bottle with a sketch of the Open Hearts symbol and Anthony dated the bottle for proper provenance! Auctioneer Keith McLane is one of the country’s preeminent fundraising auctioneers and special appeal/fund-a-need experts and the founder of KLM Auctions. Since 1995, he has specialized in organizing and conducting world-class charity and fundraising auctions from Honolulu to New York City. Keith holds an MBA from The UCLA Anderson School of Management and is a graduate of the world-famous Missouri Auction School. The Open Hearts Foundation, its supporting entities, co-chairs, and auctioneers (Event Management) are not responsible for the accuracy of the text describing the auction lots shown in this program. The descriptions may incorporate materials or descriptions furnished by donors. Prospective bidders should make their own judgements with reference to the quality, value and suitability of each or any particular auction item for their purposes, schedules and tastes. All items, including wine, are sold “as-is.” Event Management makes no warranties, assumption of liability or representation of any kind of nature, express or implied, with respect to any property included in an auction lot. Event Management may adjust or change lot order, auction protocol and the like as they deem appropriate with announcement thereof as late as the moment of change. The auctioneers shall have the absolute right to withdraw any auction lot and reject any auction bid. In the event of any dispute between bidders, the auctioneers shall have the sole and final discretion either to determine the successful bidder or to re-offer and resell the item in dispute. No bid is valid unless acknowledged as such by one of the auctioneers, and the highest bidder acknowledged by the auctioneers shall be the purchaser. A bid acknowledged by the auctioneers is a legal contract to purchase the item for the bid amount. If any dispute arises after the sale, the event records shall be conclusive in all respects. Values for items being auctioned are donor/Event Management’s best estimates, and are not warranted for general value. Any trips or events comprising all or part of an auction lot shall, unless otherwise specified in the catalog description, be subject to availability and the winning bidder must schedule such trips or events on dates mutually agreeable to the winning bidder and the lot donor(s). In addition, unless otherwise specified, winning bidders of trips or events must schedule the trip or event to occur within twelve (12) months of the auction. Donor may vary or substitute specific auction lot details if the donor is unable to provide such items due to circumstances beyond the donor’s control. The winning bidder is responsible for making reservations with the donor, unless otherwise noted.